How big a photo booth is and how much room it's going to require are both very important considerations when search for the right photo booth for your event. 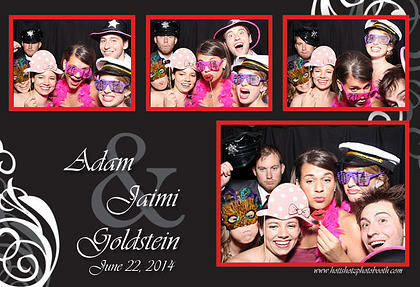 Generally, the bigger the photo booth the more people that can fit into each shot, however bigger is not always best. Larger booths take up more floor space, especially when peripheral items such as tables for props or album setups are factored in this can be quite a lot. Make sure to check with your venue as to what is appropriate. As the hirer you need to think give some thought as to what you really want from the shots you get from the photo booth. Generally, the smaller and more intimate booths (eg Traditional Enclosed) produce a completely a style of photo strip which is all about facial expressions. Whereas with your open style and bigger enclosed booths shots can look much the same as a group shot taken by a standard camera. There is no right or wrong choice just be sure to compare photo strip examples and then decide what is right for you and your event. The most common photostrip size is 2 x 6 inches (5 x 15cm) with four individual frames making up the photo strip. Many photo booths print three frames plus a logo/theme based frame, while others print five or six frames in a variety of different frame sizes often printed as a single 4 x 6 inch photo (10 x 15cm). A small number (often the less professional DIY machines) simply take normal pictures rather than photo strips. Be mindful of how you want the final product to appear before you engage a photo booth business. Photostrips are most commonly printed as doubles with the idea being the guest keeps one as a memento and the renter keeps the other. Often the renters copy (the duplicate) is mounted in a guest photo album, accompanied by a handwritten message. These days all the professional machines precut the photostrips but there are still some that require an attendant or the hirer to cut them themselves into two. There are some machines that only print single copies whilst others may offer the possibility of additional prints. Make sure you are aware of what is offered as part of your American or Canadian photo booth rental package. Nearly all photo booths require access to mains power which means setting up a booth at your local sports ground or nature reserve may be impractical whereas a photographer-operated photo booth might work well. Do not assume you can set up a booth outside as some companies may insist on weather proof shelter. Some photo booths can be quite heavy (up to 770 pounds or 350kg) so access consideration eg stairs must be clarified with the photo booth company and/or the venue to ensure access to your function space. If you have any guests that have difficulty accessing small spaces (eg guests in Wheelchairs or on crutches) you will need to consider them when choosing a suitable photo booth. For example smaller traditional enclosed photo booths normally are not big enough to accommodate a wheelchair. Little kids should also be considered as many booths cameras may be too high for them to be in shot without some assistance or a booster seat. There are a few select operators who have mini booths designed specifically for kids events.